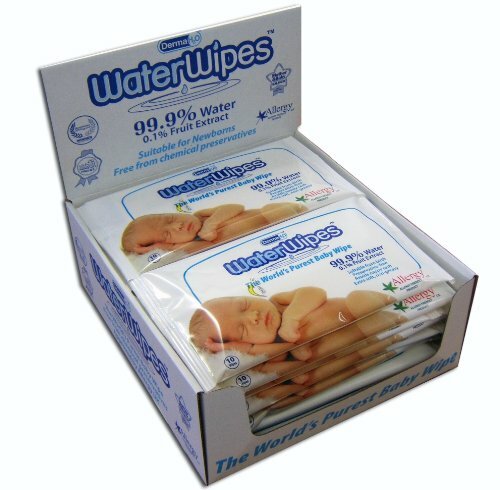 The world's purest baby wipes - 99.9% water. Safe for newborns. Effective yet ultra-mild, pure and gentle. Water wipes are unlike any other baby wipe on the market, and have been produced using cutting-edge new patent-pending technology to give unrivalled mildness, purity and safety. Conventional chemicals-based baby wipes use ingredients also found in bubble baths, shampoos, etc - but those products aren't used on a baby's skin 10+ times every day. There isn't a skincare product that you'd use on your own adult skin 70-100 times every week, so why would you do this to a small baby's delicate skin if you didn't have to? Water wipes are the baby wipe that parents and healthcare professionals have been waiting for. Cleaning a newborn baby's delicate skin requires the mildest, gentlest care possible, to avoid skin sensitization problems. Thanks to water wipes, parents have the convenience of baby wipes with the absolute purity and efficacy of cotton wool and water. With a clean, fresh non-greasy feel, they leave no residue or unwanted chemicals on the skin. Free of alcohol, perfume, chlorine, formaldehyde, parabens, phenols, phthalates, quaternary ammonium compounds, sls and sles, lanolin and unnecessary additives.